On 21 April 1958, France issued the second set of stamps in a series titled Heroes of the Resistance. This set comprised four stamps. All stamps were designed by Albert Decaris, but he only engraved two. 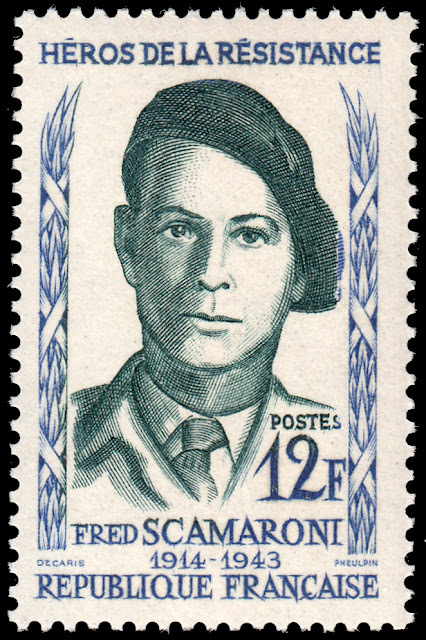 In this blog we shall study the second stamp in the set depicting Fred Scamaroni. This stamp was designed by Albert Decaris but engraved by Jean Pheulpin. Fred Scamaroni, born 24 October 1924, started his career in law after graduating from the Faculty of Law in Paris in 1934. Then in 1936 his focus shifted somewhat to the military when he became a reserve officer at Saint-Maixent, serving in the infantry as a second lieutenant. After a time he returned to Paris and became chief of staff of the prefect of Doubs. Then between 1936 and the outbreak of World War II he trained with the Air Force. Indeed, in 1940 he flew combat missions during the Battle of France (10 May - 22 June 1940). On 19 May, 1940, he was seriously injured during aerial combat. For his bravery he earned the cross of war. In June 1940 he joined the Free France forces and became a member of General de Gaulle's personal staff. In this capacity he was sent to Dakar to fight in the Anglo-Gaullist raid, which aimed to rally the immense forces of French West Africa to the Allied cause. During this mission Scamaroni was captured by Viscysts and imprisoned. He and his comrades managed to escape, but lady luck was not with them. They were captured and imprisoned yet again until their eventual release in February 1941. In 1942 he returned to France, and again joined General de Gaulle's staff, where he was placed in the French Combatant Forces (FFC). His many missions in this capacity placed him in the cross-hairs of the Gestapo. There was now a fat target on his back. Consequently, he returned to Corsica, where he had been stationed in the past, to elude capture. But in March 1943 he was captured by the OVRA, which was a secret fascist Italian police force. He was imprisoned in the citadel of Ajaccio and tortured. Then on 19 March, to ensure he did not crack under further torture, Scamaroni committed suicide in his cell. A tragic end for a brave man of La Résistance.